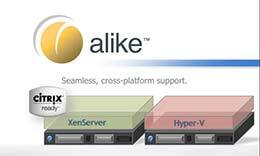 With Alike, you get cross-platform support for Hyper-V and XenServer with 100% compatibility. You can backup one hypervisor and restore to another. You can do this with just one installation of Alike – you only need to license the host server. Plus, Alike is easy to use, affordable, and it offers complete, secure protection for your Hyper-V environment. If you’re new to Alike, or considering Alike DR for your backup solution as part of a complete BDR plan, this blog post will give you the basics for backing up Hyper-V VMs with Alike. Follow these 3 easy steps to learn how to back up Hyper-V VMs with Alike. To create a new backup job, go to the Alike Web UI, and navigate to Jobs > New Job > Backup. First, you will need to name your new backup job. For this example, we named the job, “HV2012 Gen 2 – Daily,” because we know that the VM name contains the keyword, “HV2012,” and we want a daily backup of that VM. Then, you can set up your job to run manually or as a scheduled backup. Select how often you want to backup your VM (daily, one time, or monthly), and then choose the day(s) of the week you want the backups to run, how many times per day, and the total number per day. You can search for the Hyper-V VM you want to back up manually or by keyword (see notes on Policy Jobs below the slideshow). In this example, we searched for the VM using the search tool. The “By Keyword” option is designed specifically for XenServer tags. When you click the grey filter icon next to the field, you can then Filter Source Systems to find the Hyper-V host with the VM name containing the keyword. Click the drop down to view that VM, and then simply drag and drop it to the window on the right. You can also drag the entire host to back up all the guests on that host. In Alike, you have the option for individual drive selection for VMs with multiple drives if you do not want to back up the entire Hyper-V VM. Under “Select Options,” you will have the option to choose your Job Method, Email Notifications, and Misc. Options (see notes on Misc. Options below). Please Note: Advanced Snapshot Options are for XenServer only. If you want to speed up your backups, we recommend using Changed Block Tracking (CBT). Keep in mind that all CBT jobs for Hyper-V must be Enhanced jobs (agentless). Initial CBT backup jobs will take the same amount of time as non-CBT initial backup jobs. Subsequent CBT jobs will be significantly faster. After you’ve completed the previous steps, save your job. You will see a green bar at the bottom of the window indicating that the job has been saved. And you’re done! One of the most convenient features in Alike is the option to create a “Policy Job” (refer to Step 4.). Policy backup jobs essentially allow you to create a dynamic VM inclusion from the keyword term. Then, every time a policy based backup job runs, Alike will search on all systems for that keyword to find systems to include. This is very convenient for large companies with various naming conventions. To learn more, check out our video on Policy Jobs in Alike. When you run a backup job in Alike, the default option is to process the VMs one at a time in the order they are listed. However, you can change the “job concurrency” to process more than one VM at a time, and Alike will run the number of jobs you have entered at the same time. Keep in mind that this setting will determine how many ABDs Alike will create for that particular job. Learn more about ABDs in our blog post on ABD basics. You also have the option to select the number of retry attempts if a VM fails during data acquisition. The default is “zero.” To learn more, please refer to our blog post on this option. Basic retention is the default mechanism for all backups in Alike, and this is what most users choose for their backups. However, if you have more complex needs, you have the flexibility in Alike to choose GFS retention. If you’re using Offsite Vaulting (Alike DR only) to store your backup jobs, select this option. You will also need to set up your Offsite Vaulting in Tools > Settings > Storage Settings. Learn more about Offsite Vaulting here. Alike provides a simple, affordable backup solution for Hyper-V. IT pros around the globe choose Alike because it saves time and storage space, allowing users to spend their IT resources on other important projects. Higher performance and faster backups using Changed Block Tracking for Hyper-V backups and replication. Reduced storage space and I/O with Alike’s impressive global deduplication. File Level Restore options provide more flexibility and can help you meet your RTO and RPO goals. With an unlimited number of protected Hyper-V VMs per license, you don’t need to spend your entire budget on expensive licensing. Minimize IT resources and save time with Alike’s easy-to-use web UI. Easily monitor your system’s health at a glance and minimize data corruption with Alike’s self-healing technology and bottleneck detection feature. Full access to our expert and friendly tech support team with our flexible maintenance plans. Want to test out Alike in your Hyper-V or mixed XenServer environment? Sign up for our 30-day, no obligation Free Trial. You also get full access to our technical support to help you out during your free trial.